An interesting editorial in Racecar Engineering magazine about the Dakar Rally and the extremes of endurance needed to complete the event, started me thinking about the kind of rallies I used to enter. Now, my rally days are far behind me; so far that I often joke about how my co-driver had to run in front of the car with a red flag, and how Queen Victoria used to come out to watch. She wasn’t amused. Okay, my rally days weren’t that far back, but far enough that the sport has changed dramatically between then and now. 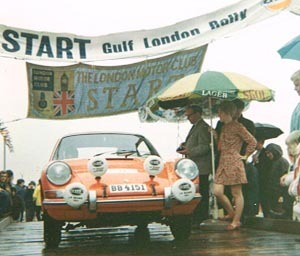 I was reminded initially of something called the Gulf London Rally which took place in the mid 1960s. No, it didn’t go from the Gulf to London, but rather it started and ended in London, and was sponsored by Gulf Oil. It was a summertime event which covered pretty-much the whole of England, Scotland and Wales, taking in many of the stages made famous by the RAC Rally, or Lombard, or whatever it was called at the time. Unlike today, many of those stages were 80kms or longer … with no pace notes. Probably the scenery was spectacular, but no one noticed. The rally’s main feature was that it lasted six days, with only two significant rest stops of just four hours each. The other breaks were for car repair, eating, and the sheer pleasure of putting one’s bum on a wooden seat rather than squatting in a field. And most breaks were only thirty to sixty minutes. That was endurance. Oh, and I seem to remember there was a full entry of 240 cars! One year I was persuaded to be part of a Service Crew. 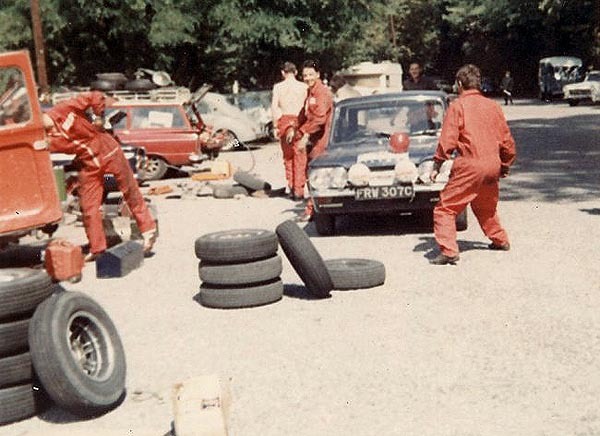 There were no official service parks, and mostly the task involved chasing the rally car from stage end to stage end, in order to be on hand in time to effect any needed repairs. Even with two service crews per car, it wasn’t easy with a fully loaded station wagon, to be in the pre-agreed location at the pre-agreed time. It was an interesting challenge to drive fast in something with seriously overworked suspension, good old-fashioned drum brakes, and tires well past their sell-by date. 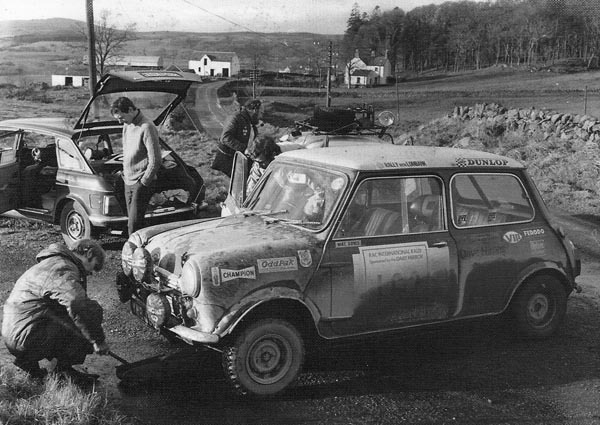 I recall one RAC Rally where the rally car we were servicing had broken down somewhere in Yorkshire. So we added the second service crew to our already overloaded station wagon and set out to help. Not being able to fix the rally car, we then added the rally crew as well, and I vividly recall trying to keep the car pointing in the right direction, as we descended a snow-covered hill in a rented station wagon with seven people inside, spares in the back and on people’s laps, and tires on a roof rack. Luckily, when I returned the car, it was p*ss*ng with rain, and the rental people couldn’t be bothered to do their usual inspection, so I didn’t have to explain various dents on pretty-much every body panel except the roof. On the Gulf London, we had three people in the service car, with one back seat reserved for sleeping, nicely equipped with pillows and blankets. What bliss! The idea was to take turns at sleeping, but the main mechanic (I was “hired” to drive) became ill, and could only function if he spent all the time between his mechanicing duties, fast asleep. Every time we reached an agreed service point, the guy was un-ceremonially dragged out of the car, spent a frantic fifteen minutes doing what rally mechanics do best, usually lying on his back in mud, and then bundled back into the rear seat and recovered with the blankets. I guess you could say he recovered while he was recovered. Perhaps not. Anyways, he survived; as did the other two of us, with me sleeping in the co-driver’s seat on the rare occasions there were road sections long enough that didn’t need a navigator. Sadly, the same cannot be said of our other service crew. Somewhere in the wilds of Scotland, after some four days of driving with minimal sleep, the driver dozed off. The car hit a stone bridge, resulting in one fatality, and one serious injury. It’s the only time in my life I’ve been asked to identify a body, and if you were wondering, yes, it’s just like you see on TV. A chrome handle is pulled. A narrow metal tray (he’s not going to fall off is he) with something hidden under a green sheet, is pulled out. The sheet is lifted, and there you have just enough of a pale face visible to effect an identification. You nod, and the tray goes back in the wall. As you can imagine, it’s a traumatic experience, but luckily I didn’t know the guy well. Just well enough to know it was him. Plus, I figured it was better to be the identifier than the identified. But, motorsport was like that in those days. No one thought about safety. People died in motorsport, climbing mountains, breaking records, and walking to poles. But they died doing what they most wanted to do in life. Which brings me back to the Dakar Rally. Every year a few people still die on this event, whether competitors or spectators, and sometimes even organizers. But thankfully, there is still that one nutty rally that keeps happening each year. And all of this has dragged up other thoughts about other rallies. Next time.